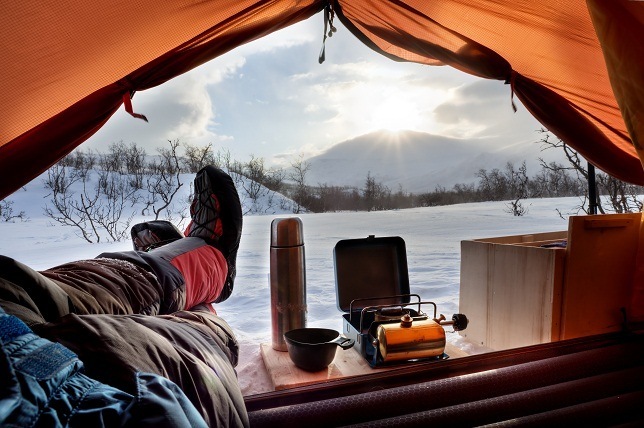 Camping in the winter months is something of an art and it is definitely not for those who are faint of heart. The winters in the US and especially Canada can easily reach the minus degrees and many people are not use to camping in these extreme conditions. We decided to look a little deeper and find out how to stay warm in a tent the next time you decide to brave the winter and go camping. 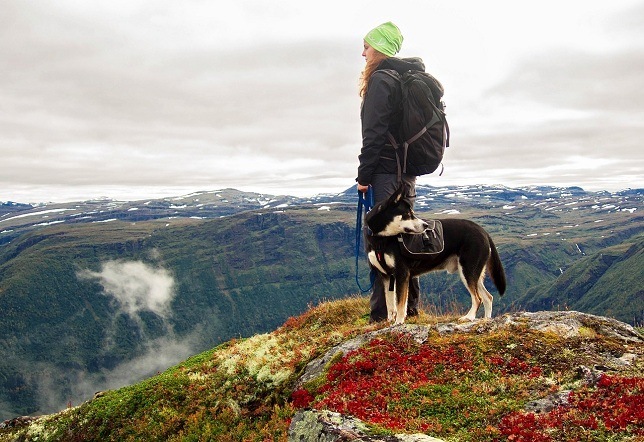 These ideas might not be applicable to all circumstances, but we do believe that you should get a few ideas that you could utilize on your next camping trip into sub-zero degree temperatures. 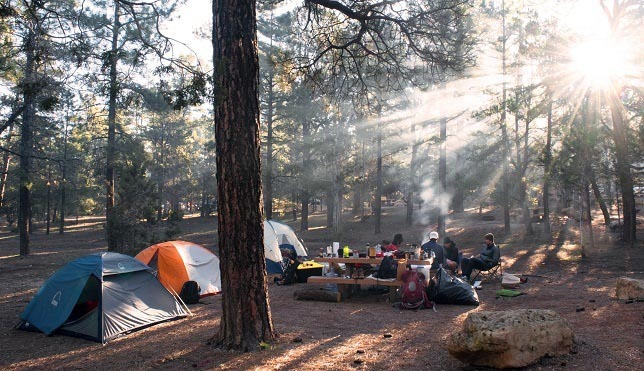 The campsite and the surrounding areas will definitely play a huge role when you are looking for a warm camping location. The more trees you find in the surrounding you, the more it will break the cold wind and keep the wind from reaching you. Should the wind be tough and rough, you might need to find a way to insulate the ventilation holes. Small towels can be strapped to these holes and keep the cold wind out. Rain sometimes coincides with snow and cold weather and you might sometimes find that your sleeping bag will get some moisture due to high levels of moisture in the air. If you have a down sleeping bag, this could be a bad, as down takes longer to dry out. Bottom Line: We recommend rolling up the sleeping bag when it is not in use and storing it in the waterproof cover. Campfires should always be watched over and you should never make a campfire when you are not outside to keep an eye on the flames. As the sun starts going down, you could make a campfire while you are outside. Be careful not to burn the tent, but if it is in close proximity to the tent, you will find that the entire tent warms up. 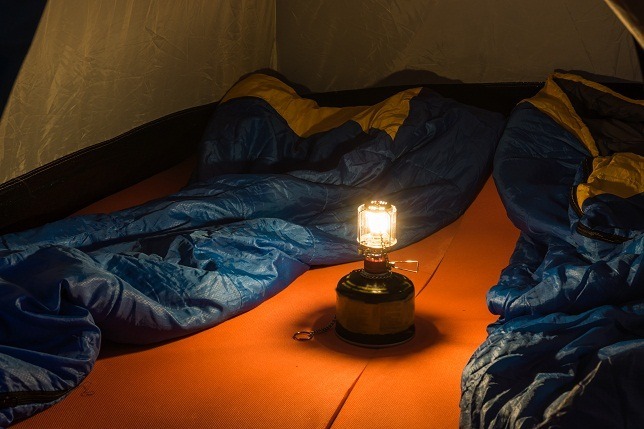 If your tent is well insulated, the heat should stay inside and you will have a warm night’s sleep. A standard jacket might not suffice and you should consider adding more layers of clothing. You can easily take one off as you start getting warmer, but layers of clothing with good insulation will ensure that the wind cannot reach your body. The more layers of clothing you have, the more your body heat should keep you warm. Whilst being outdoors and exploring the wild, it can be easy to get your clothing articles wet. It is also quite hard to get these items dry when it is constantly snowing. By having a pair of socks and gloves for sleeping purposes only, you will be guaranteed that your feet and hands will be insulated whilst sleeping at night. When your tent is insulated and you are entrenched on the inside of a warm sleeping bag, it can be tempting to fully zip up the bag and cover your entire face. The danger that comes with doing this is overheating and lack of oxygen. When you find yourself overheating, you will be tempted to take everything off and this could potentially lead to getting a cold. The other issue is a lack of oxygen and while you might have enough oxygen before you fall asleep, you will find it quite claustrophobic when you wake up gasping for air. Sometimes you might not even be fully conscious and without consciousness, you could easily suffocate inside your own sleeping bag. Bottom Line: We highly recommend that you do keep your face above the bag to ensure an optimal chance of getting oxygen and to avoid overheating. Heat escapes through the ground and through our heads and since you will have a good sleeping bag to keep the heat inside, you might find that your body loses a lot of heat through your head. To avoid this you should consider wearing a thick and insulated stocking hat to bed. The stocking hat will ensure that heat is trapped and cannot escape through the head. You should also get comfortable at sleeping with one of these hats since they might occasionally cause you to overheat as well. If your tent is warm enough on the inside, you could leave the stocking hat. It is definitely down to personal preference. Many of us do suffer from bad blood circulation and this could be due to various reasons. But our feet and hands generally take the longest to warm up when we are freezing. Some people also cannot sleep if their feet are not warm, but luckily there is a solution. You should consider sleeping with your feet in a half bag as this will keep them together and they should warm up much faster. We believe that the added insulation will keep them from going cold again and you will have a much better night’s rest when you have your feet warm. Nothing gets the blood flowing like moving your body a little and doing a few exercises. A short hike around the camping area will not tire you out too much and the blood will start flowing to the vital areas of the body. Once the blood is circulating better, your body will gradually warm up and you might even find yourself breaking a sweat. We would also like to mention that if you do start to sweat, you should wipe it off as soon as possible. The cold wind will dry the sweat and this will also cause the wind to feel much colder on your skin. Take a towel a long and warm your body up to ensure that you could stay warm. Hydration is a big part when it comes to surviving these cold temperatures. The body does use up much more electrolytes to keep us warm in the winter and this makes hydration fundamentally important. At night this could become a problem and nothing can be more frustrating that needing to take a pee every five minutes. In that case you should limit your fluid intake at night to ensure that you need not go outside to relieve yourself. A water bottle can only hold a little bit of pee and you also do not want to go outside to empty it every hour. A big part of survival is to compromise and get past a few of the things you hate. While peeing in a bottle is not the cleanliest, nor the most hygienic way to go about doing your thing, it sometimes is the best way to ensure that you do stay warm. Since you will also be limiting your fluid intake at night, this should not be a problem and you might only have to bare through the experience once before you could go outside the next morning. Bottom Line: We do recommend that you keep the bottle separate, you might get thirsty at night and drinking from the wrong bottle will certainly not improve your morale throughout the night. Water is a great resource when you find yourself cold in the wild. It can be used to keep you hydrated and you can even use it to make a hot drink or two. Water can also be boiled and poured into water bottles to serve as some sort of water bag and if you place them strategically around the tent, you will find that the tent does start to warm up ever so slightly. Use these bottles with caution if you have children with you and to notify them of the locations. Nothing can be as excruciating as having boiling hot water on your skin when your body temperature is low. Bottom Line: This can also be dangerous and we do recommend doing so with caution as leaking bottles could damage your tent. During the snow season, you will find snow everywhere and on everything. It is important to shake the snow and water off your tent as this will automatically cool the temperature of the materials. You also run the risk of having the tent tear due to the excess weight and it will be excruciating to spend a night in a tent with cold water or snow dripping down on your body. Using a portable gas heater is a good way to keep you warm when you are inside a tent. There are; however, a few safety precautions that we do recommend you take. Gas heaters will dry out the air and they will also take away some of the oxygen found in the air. Gas heaters should also be checked for leaks and you should turn them off before going to sleep. We also recommend that you do invest in a modern gas heater with safety features built in. Many gas heaters will actually switch off after a certain time and other will automatically turn off once the fall. These safety precautions could potentially save you from grave danger. Many people might be in sleeping clothes inside the tent and then you need to be or go have a smoke. You might not know it, but your clothes will take in some of the moisture in the air and this will eventually play a role when you are trying to re-heat yourself on the inside of the tent. To be safe, we recommend that you do take off those sleeping clothes to finish your business outside, and then you can be assured that your sleeping clothes will be dry and ready when you are ready for bed. Consider taking along another pair of sleeping clothes just in case. When camping in the cold snowy mountains, one can never be too prepared for the weather. There are a lot of gimmicky items available to keep you warm, but nothing will be as satisfying or work as quickly a body heat and good company. By going with your husband or wife, you will have the advantage of good company to distract you from the freezing weather. Two bodies will also warm up much faster than having your own body warmed up. We still recommend that you consider buying things to keep you warm, but nothing will be as amazing as having the love of your life in your arms while warming up underneath a bed of snow in the winter. A tent footprint is quite nice and also relatively cheap. It will add another layer of comfort and also keep the moisture from soaking the tent floor. Once the tent floor is soaked, everything on the inside will also be drenched in water. The tent footprint will also make the cleaning process much easier and enhance the lifetime of the tent floor. Space blankets are actually really affordable and they can easily be found on the market today. The nice thing about a space blanket is that it will keep reflecting the heat back to your body. Since or body loses a lot of heat when we are sleeping, the space blanket could be a good investment that will ensure that you always stay warm in the winter. As we have already mentioned, the body does burn more electrolytes when heating up the body. It also burns up about three times the calories just to keep your body at its normal temperature and this could lead to you having that feeling of constant hunger. 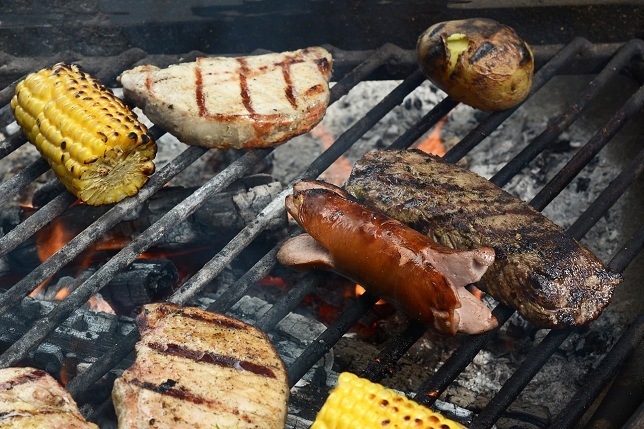 Before nightfall, we recommend eating calorie-filled dinner with lots of good fats and protein to help your body maintain that warm body temperature. You might also want to consider adding a few snacks as well, just to ensure that your body is fully energized and full of calories. Not all sleeping bags are designed for the winter and you might have to spend a few extra bucks to ensure that you do get a good sleeping bag to keep you warm in the winter. Sleeping bags are generally rated by the temperature it can withstand and having a good sleeping bag to keep you warm will actually make a big difference. Down sleeping bags are generally recommended for these temperatures, but you should keep in mind that down does not go well with wet weather and it is imperative that you keep the sleeping bag dry at all costs. Synthetic sleeping bags might be cheap, but they cannot withstand the cold as much as down and feathers. Just like sleeping bags, tents are also rated according to their capabilities of withstanding cold and having good insulation. The 4 Seasons tent is great for all conditions and while it might not be perfect for winter temperatures, it will keep you warm once you add extra insulation to the vents. The winter tent is probably the best option and it has specifically been designed to make life easier for you and to keep you warm. Winter tents do not have as much ventilation holes and this does mean that they are much more insulated to keep the wind out. These tents are also designed to ensure that your heat does not escape as easily, but you will still need a good sleeping bag. A good insulating sleeping pad will not only provide you with more comfort when going to bed, but it will also keep you insulated. Since a lot of our escapes through the ground, a sleeping pad will be perfect and ensure that you do not have to add more blankets underneath your body to stay warm. Most advanced sleeping bags will even offer an additional sleeve for the sleeping pad to slide into and this means that you will not find yourself rolling off the pad at night. Rocks are not really good for much, but when you combine them with fire, they will surely keep you warm. Start by heating the rocks in the fire until they are extremely hot. After they are hot. Move them away from the fire to cool down and when they are cold enough to handle, you should wrap them in towels and keep them inside the tent. If you do not have towels, you could use some dirty clothes as well. Just be sure that they will not burn the clothes. 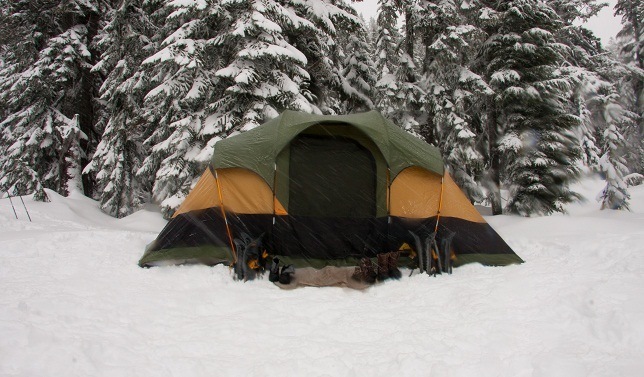 Snow will become heavy through the night and after too much rainfall, some tent will sometimes give in and start to leak. While we have already mentioned that you should shake off the snow and water, we would also like to recommend that you consider setting up a tarp over the tent. The nice thing about a tarp is that you will have the ability to angle it down and allow the water and snow to escape without hitting your tent. This will improve the durability of your tent and also add another layer of external insulation to keep you warm and away from the elements. Last but certainly not least, you should consider the tent size. 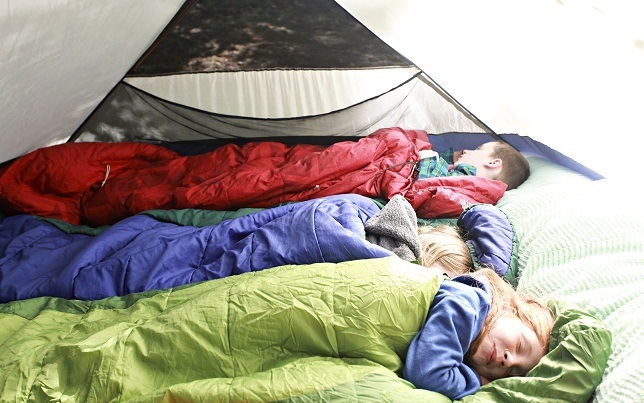 There is absolutely no use in buying a four person tent if you are only going to be one or two people. A larger tent will offer much more storage space, but it will also be a lot harder to keep the heat close to your body and there will more area for the heat to escape. We recommend buying the right sized tent along with the right tent type to ensure that you are warm and insulated. 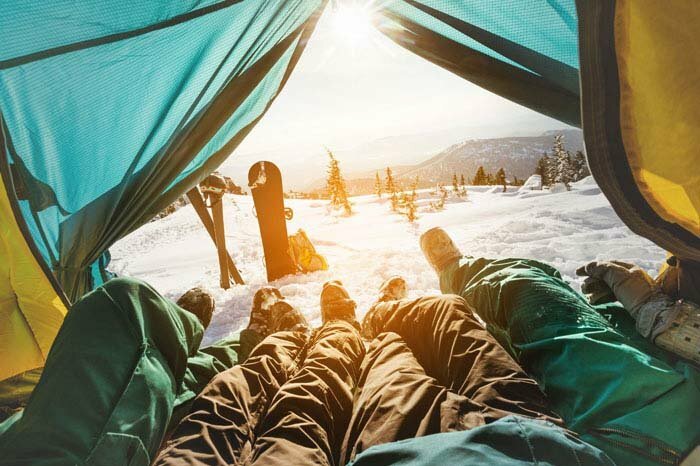 We do hope that you managed to find a few tips to stay warm in a tent for your next winter camping trip. 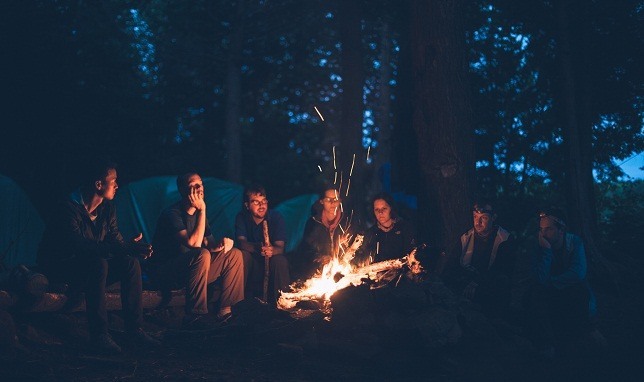 We would like to encourage you to share your tips and if you have prior experiences with camping in the cold weather, please share your knowledge in the comment below. Thanks for sharing us such useful tips. I love your infographic. It looks really nice.